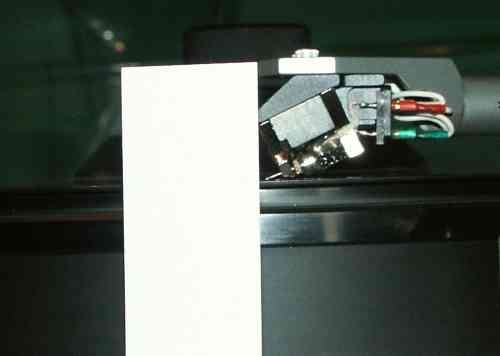 The angle the cantilever makes with the record surface is just one factor chosen by the cartridge manufacturer so that the stylus swings through an arc which best approximates the cutting head angle for that cartridge and that cartridge only, in order that the stylus follows, as nearly as possible, the same trajectory as the cutter. Not only will the cantilever/disc angle have an effect, but also the length and flexibility of the cantilever, compliance, tracking weight, temperature, actual pivot point (which being an elastic block will alter in real time) and so on. In addition the drag on the stylus, which alters depending on the 'cut' of the record and of course the changing dynamics of the music, will have an effect. 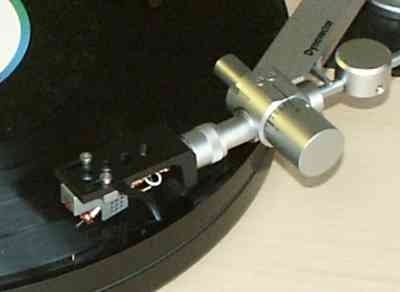 Now going back to the arm we can see that with the range of height adjustment available on most tonearms we can only adjust this angle by a couple of degrees or so, the actual VTA (see Fig 2. )being determined primarily by the cartridge manufacturer, and the manufacturers settings vary by more than 10 degrees(1*) - we just have to put up with it. If true VTA varies by 10 degrees or more depending on the cartridge used, and the cutting angles of discs varies by up to 20 degrees, and we have only a couple of degrees of adjustment available, then to talk about adjusting arm height to give 'correct' VTA is clearly nonsense. Perhaps in a perfect world all records would be cut at the same angle and all cartridge VTA's standardised also, but for now let's try to stay in the real world. What we can do, is to alter the angle that the stylus makes relative to the surface of the disc, and thus how well that line-contact stylus matches the ridges cut by the original lathe onto the groove wall. This is called the SRA (Stylus Rake Angle) and regardless of the cantilever/disc, or VTA angle of a cartridge, all manufacturers will (hopefully!) set their stylus's to approximate a 'standard' angle(*2), otherwise the stylus wouldn't sit in the groove when fitted to a roughly horizontal arm. Our adjustments have a primary purpose of fine tuning SRA, though other parameters such as 'overhang' will alter by ludicrously small amounts. 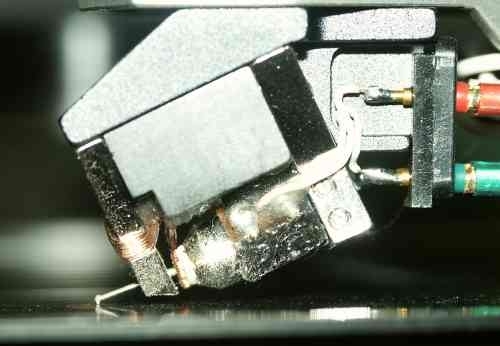 I've a fair experience of high-end tonearms, but up until recently most of them have used SRA adjustment which involved the traditional "undo the allen bolt and wiggle", a method that gives an accuracy of +/- 0.5mm on a good day, and with no scale, so you cannot easily reverse changes. My own SME 4 was the best of the bunch with a threaded bar allowing the arm to be lifted smoothly but it's hardly repeatable on a record by record basis. Using all these arms, I've played the "find the sweet spot" game with SRA and in all honesty I've found it hard to convince myself that changes of +/-0.5 mm were make or break when it came to alignment. The fussiest cartridge I've ever tried is "The Cartridge Man's" Music Maker. This, it is claimed, uses the longest line-contact stylus in the business and so its sensitivity to SRA is understandable. If the arm slopes up to the pivot the Music Maker can be a bit splashy with sibilants, but moving it down level or slightly tail down cleans it up. So personally once SRA has been set for a particular cartridge I leave it alone. But fair enough, I've never claimed to have 'golden ears' so I just can't hear what others can, just like I can't tell the vintage of a wine without reading the label. Anyway I have to admit that it did make me wonder whether I was actually deaf and should therefore keep my mouth shut. But things kept nagging at me. Some of the most pro-VTA (sic) posts and articles seemed so well argued, so authoritative, but my scientific training kept flashing up a red light. Sometimes these learned writers left holes that you could ride a coach and horses through, or simply defied common sense. One which caught my eye, was an excellent article that went into the relevant importance of SRA and VTA (hooray) and went on to list what order of distortion was caused by each and the effect this had. I was well impressed. The author then went on to explain that to set correct SRA you simply place the stylus on the record and adjust the angle so that the stylus leaned forwards one degree off vertical. Perfect. I was interested by a couple of follow up posts asking the 'guru' the best way of measuring this and the use of backlighting was put forward as a useful aid. I now refer you to the picture reproduced here of a Dynavector DRT-1s tracking a record, about 10x life size. It's a beautiful cartridge for such alignment, the stylus is perfectly visible. Hands up everyone who could tell me the SRA to an accuracy of +/- 0.5 degree (which equals over 5mm of arm height adjustment on a 12" arm!) using the enlarged photo above. OK so that makes me blind as well as deaf. I then trawled various papers and articles on the subject. 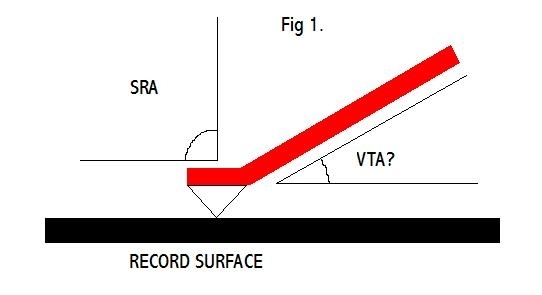 These were often confused or just contradictory, one (*3) technical article explained the critical nature of VTA, and then went on to suggest that the best compromise given the different cutting angles and record thicknesses used, was to set the arm for the highest VTA and then use cardboard shims "or another record" to alter VTA. Now I may be so deaf that a 0.5 mm change in VTA is inaudible, but put a pile of cardboard or another record under one of my slabs of vinyl and I can certainly hear that! But what made me finally put finger to keyboard wasn't an old article or a newsgroup post - heaven knows there are enough nutters out there with access to the 'Net'. No, the final straw was a review of the VPI 12.5 tonearm by Roy Gregory. Roy Gregory is one of the 'Big Three' reviewers in Britain. He is also editor of Hi Fi+, probably the foremost high-end review magazine in the UK. The review of the arm (and VPI turntable) was the usual beautiful piece of work. In it he mentioned the arm's ability to offer micrometric, repeatable VTA adjustment. So important did Mr Gregory consider this feature that he dedicated a whole section of the review to (I quote) "VTA - The Forgotten Factor". For the full article see http://www.hifiplus.com/t-rev10-1.html and please because of the 'postcript I INSIST that you go there and read the full article for yourself. Great! I thought. Just what I need for my Tri-Planar review - nothing like a bit of plagiarism :-). It was a masterful description of the effect and importance of correct VTA. The VPI had the best VTA adjustment possible with each click of it's adjustment being 0.35 thousandths of an inch! Then using a favourite review record he gently walked us through the effect of raising and lowering the VTA tower. He concluded that VTA adjustments of less than +/-2 'clicks' from the ideal made vital differences to the sound. Wow! What had I been doing wrong all this time with my hoiking arms up and down a couple of mm at a time, being happy with "a bit tail down" for a cartridge? How could I be so deaf? My system is an ultra high-resolution valve and horn set-up, how could I have missed it? I read the review again and again, fiddled with the Tri-Planar to try to get the same effect, no joy. Then a little voice in my head began to nag at me? Maybe it isn't me? Maybe it's all rubbish? So I began to ask myself questions. "If Mr Gregory et al are correct what are the implications for record users?" "What kind of accuracy are we really expected to work to?" "Is any arm lacking such an adjustment fundamentally flawed?" Assuming the VPI to have a 300mm effective length, to get a one degree change of SRA we need to alter arm height by 5.23mm. A 1.0mm change in arm height changes SRA by 0.19 degrees. The VPI's VTA adjuster clicks equate to 0.35 thousandths of an inch according to Mr Gregory. As there are 26mm in an inch that translates to 0.00035x26 = 0.0091mm, i.e less than one hundredth of a mm... He says that changes of +/-2 clicks produce a "vital" change in sound quality. So once you've found that sweet-spot a change of 0.018 mm (2x0.0091) will lose that perfect reproduction. Now just to drive that point home that 0.018 mm equates to a 0.00342 (0.19x0.018) degree change in SRA. Just over THREE THOUSANDTHS OF ONE DEGREE! Now remember that this statement has been made by one of the pillars of the Hi-Fi journalistic establishment - a man with the power to make or break a manufacturer, and one to whom people (including me) turn as an authoritative source. He was also so sure of his case he used it as justification for an attack on the British hi-fi industry for not including VTA adjusters - it was, quote "another aspect of the UK's institutional analogue arrogance". Just because I can't hear what he can doesn't mean he's wrong and I'm right. I have no doubt whatsoever (this is not false modesty) that his ears are more 'golden' than mine, (as are many other people's!). So now I had to work on the assumption that he was right. In the real world what were the implications of the need for such staggering accuracy in SRA. I then contacted a hi-end turntable manufacturer of impeccable credentials and he told me that standard practice in the record industry was to 'pass' records that were within +/- 1.0mm when they came out of the mould. He then went on to tell me that his platters are rejected if the 'run-out' exceeded +/-0.1mm - more than five times Roy Gregory's vital limit. Now assuming that this manufacturer was exceptionally sloppy and that Mr Gregory's platter is perfect, we are still left with the fact that for the vast majority of records he will be clearly able to hear the sound swing in and out of the 'sweet spot'. Having had the seeds of doubt sown by one manufacturer I decided to contact a maker of high-end cartridges Len Gregory, who makes both the Music Maker and retips/rebuilds cartridges for a living. What did the 'Cartridge Man' have to say? "It's all a load of rubbish, my cartridge is one of the most sensitive you can get and copes with different thicknesses of records without any faffing about with the arm". OK what do manufacturers that make both arms and cartridges think? Well I didn't need to ask because I could see what they actually did... To my knowledge only two major manufacturers of high-end cartridges make arms - Dynavector and ClearAudio. And you know what? Both make arms where the armtube is very, very short, the 507 (see pic) for Dynavector and the Sowther types for ClearAudio. For example the 507 has an armtube with an effective length of only 85mm. That means that any SRA error, either from warps or adjustment will be multiplied by a factor of over 3.5 compared to the VPI 12" arm. The ClearAudio is much the same. So two of the biggest names in hi-end cartridges don't put SRA at the top of their priorities. And then there's just common sense. Look at the picture of the line-contact stylus used by Dynavector, one of the most complex in the business. Is it hard edged and cut to perfection so that a hundredth of a degree of misalignment would ruin its performance? No - it's got smooth rounded edges otherwise it would eat your records, and I simply cannot believe that it's going to be fussy over much less than a degree. The use of SRA towers is now so established that in some markets, notably Japan and the USA , any arm that doesn't offer a micrometric SRA adjustment is at a severe commercial disadvantage. (note - Mr Gregory informs me that this is no longer true and that the Japanese manufacturers who started the ball rolling have removed VTA adjusters from their arms - interesting...). So maybe Roy Gregory is hearing something after all, after all he certainly believes so, but what? What parameters alter when you change arm height? VTA - we've already dealt with that. SRA - possible but the changes wrought by a 0.1mm change in arm height are very small (0.019 degrees) and I'm not convinced. Tracking weight? Well yes this can alter by small amounts because you are moving the centre of gravity. Then I had the proverbial 'light-bulb' above me. In this one respect arms are not even remotely equal. An arm with a high centre of gravity, up near the bearing/stylus axis, will show very small changes in tracking weight. An arm with a low centre of gravity will have much bigger changes as the centre of gravity will swing in an arc under the tonearm, being in turn raised and lowered by the stylus. The bigger the arm height change, the bigger the tracking weight change. And of course changes in tracking weight alter two fundamental variables. The position of the stylus coils and magnets relative to each other, and SRA as the cantilever pivots to accommodate the change in weight. Feeding the sums into my arm formula, shows that for a 4 mm cantilever, a 1 degree change of SRA can be caused by a 0.035mm tip movement, invisible to the human eye. I've no problem thinking that such a large change in SRA is significant. Some proponents of critical arm height adjustment put SRA changes of 0.01 and less as significant, how small a change of tracking weight is needed for that? Well it'll depend on the compliance of your cartridge, but it is thought provoking. So could this be the answer? Granted it doesn't explain everthing the 'pro VTA' camp say but neither does anything else. The VPI has a very, very low centre of gravity, it's a unipivot with a hefty steel ring under the bearing in order to give stability. There is no doubt that the effect on tracking weight from changing arm height will be much greater on this than say my SME, or a Rega? You see the point? Maybe, just maybe I'm not sensitive to tiny arm height changes because my arm isn't? Once I've set tracking weight (to great accuracy I might add because it makes a difference!) I can play different thicknesses of records and have little change in tracking weight. With a low slung arm (generally unipivots) does a change in record thickness alter tracking weight and need a very accurate change in arm height to bring things back to perfection? Is a VTA tower primarily acting as a very fine downforce adjuster? Isn't it more than a coincidence that when people describe the changes wrought by altering arm height they are very similar to those produced when we alter downforce? Do such arms get away with crude downforce adjustment (unlike the SME) precisely because they can fine tune it because of the position of the arm's centre of gravity and the provision of a VTA tower? NB. To tell if your arm has a high or low centre of gravity just disconnect any damping and set it to zero tracking force. An arm where the centre of gravity is on the stylus/pivot axis will 'float', if you raise the stylus it will rest where you put it or drift very slowly. An arm with a low centre of gravity will quickly swing down, rock like a pendulum and then settle horizontal. Or if not that perhaps it's simply the machanics of the thing. Almost all these SRA adjusters work by having a tower with a thread in it, which, by turning a knob at the top racks the arm up and down. NO thread is perfect. At a microscopic level (which after all is the level Mr Gregory is working to) the threads will be out of true both eccentrically and in relation to the thread-to-thread interface. As you turn the adjuster these threads will settle into better or worse states and these states will be repeatable. So for example, after finding a sweet spot you wind the arm up, you will find the same sweet spot by winding down again. And there will be several sweet spots all along the thread, so if you do a rough adjustment, say for a thicker record, you will be able to find a sweet spot somewhere near that would give the impression of there being an optimum SRA. A similar effect might be produced by sweet spots in the bearings of the arm, the position of the internal arm cable, the various 'locking' devices or maybe some unknown parameter - who knows? IF, and only if you are prepared to do all this, then consider yourself to be a fully paid-up member of the 'VTA' club, because if any of the above are missed out then you are deluding yourself. Regular readers will have spotted that this article was 'pulled' for all of last week. This was because Mr Roy Gregory rang me at home saying I was guilty of copyright infringement. Being ignorant in these matters and a born coward I pulled the article. But I'm not stupid and spent the week checking copyright law on the internet and eventually consulting copyright lawyers, because if Mr Gregory was correct in citing copyright infringement then it would make any comment, critical or otherwise, of any article impossible. Luckily for me the law thinks so too and includes a clause called 'fair use' and this article satisfies that requirement by a country mile (phew!). Mr Gregory's second reason for wanting the article removed was that it was defamatory because it questioned his integrity. After reading this article through a 100 times I still have no idea what he is talking about. It might question his ideas, but nothing else. Note - Apart from my thoughts on what might cause the VPI to be more critical of arm height than some other arms (and thanks to Roy Gregory for provoking me into it) the rewritten article does have a few very minor changes, but only because I used the opportunity to make a few things clearer, or put them in better English - not because of Mr Gregory's intervention - anyone doubting this can email me and I will be happy to send a copy of the original article so you can see where changes have been made. Well either way I think we are agreed that VTA is a controversial subject! My problem with it is that just about all the evidence for it is of the "I sat with my friends and I twiddled the arm and we could all hear it" variety. Even some of the more serious papers would end up in the bin at New Scientist because so many variables and the human factor has been ignored. All the evidence I've so far found (I'd be grateful if anyone could send scientific evidence) I would class as hearsay and as any lawyer or scientist will tell you, hearsay is worthless. 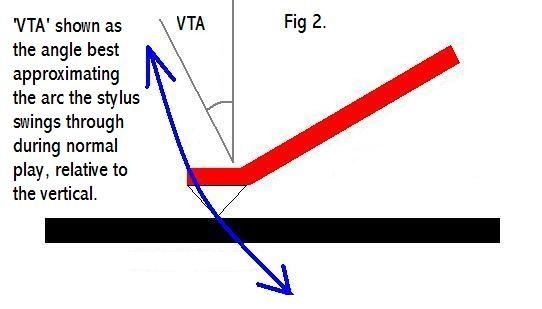 I find this incredibly frustrating as it's an interesting subject, and contrary to what you might think I have no position on the importance of VTA (except that currently I can't hear it and that my system/records arn't capable of showing it - which proves precisely nothing) and am merely seeking truth. Nothing would make me happier than to pin down the critical nature of VTA or otherwise so that we can either move on or change the way we listen to music. *1 - This according to "Three FM Methods for Measuring Tracking Angles of Phono Pickups" by James V White and Arthur J.Gust from the Journal of the Audio Engineering Soc April 1979. *4 - David Shreve's TAS article from 1976 - However it did go on to mention the chaos of non-standard VTA in cartridges and record cutting. *6 - Using a 'VTA' tower adds a large number of components and more importantly a mass of new boundaries (nothing is worse than threads...). 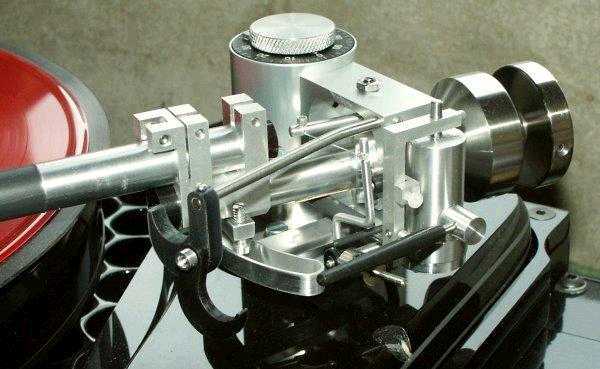 It's widely accepted that all things being equal, the simpler the basic construction of an arm the better it would sound, this is why we have one-piece tonearms, non-removeable headshells, all-in-one cartridge/arm assemblies etc. VPI have even removed any anti-skate device from their arms because of the detrimental effects it has, and yet they, and others are content to have a complex design and a mounting system that is compromised in order to chase 'VTA'. The Triplanar was a good arm but how good would it have been if it dispensed with the 'VTA' tower and used a solid mount? The snag is that manufacturers don't make identical arms with and without VTA towers (if anyone knows of some let me know and I'll try to borrow them) so that I can pin this down. Likewise the longer an arm the less stiff it is and the higher it's effective mass unless the tube is made thinner (and thus even less stiff), does the better geometry make up for this? *7 - I guess you're going to ask me what I consider the critical limits of SRA and arm height. Here, with my gear and brass ears I'm happy setting arm height within +/- 1 mm, and if pushed I could live with errors bigger than that. SRA/VTA matters of course, but in the real world not THAT much, rigidity, simplicity and lateral alignment are all more important.